On Sunday, 8 September 2013 the Biographical Database of Australia was launched at the Royal Australian Historical Society, Macquarie Street, Sydney, by Dr Carol Liston, Associate Professor of the School of Humanities and Communication Arts at the University of Western Sydney. She said the project would prove to be a boon for both historians and genealogists. The not-for-profit database is the result of many years of work by volunteer genealogists, historians and contractors. The project is the brainchild of Keith Johnson and Malcolm Sainty, founders of the Library of Australia History, publisher of the 1828 Census of NSW more than 30 years ago. Both men spoke at the launch and called for the public to support the project by joining as subscribers or volunteering to help BDA’s aim of transcribing and indexing biographical data from original records of individuals who arrived from overseas or were born in Australia, including Aboriginal people, convicts and immigrants of all nations. BDA also aims to include data from early biographical dictionaries, newspapers and other published information and to incorporate the work of modern genealogical and historical researchers. The only restriction is that biographical subjects must be deceased. 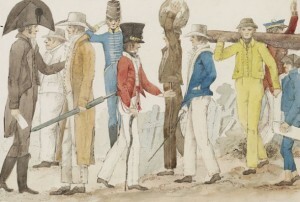 The Costume of the Australasians by Edward Close, 1817-1849 (c). Courtesy of State Library of NSW. 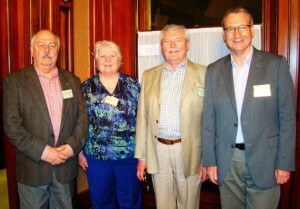 Michael Flynn, a member of the BDA board, presented an online demonstration of the database, containing transcribed manuscript and published records which are being progressively linked to form a biographical timeline of each person. This first release contains over 500,000 entries: convict, muster, census, baptism, marriage and burial records for most of the New South Wales population 1788-1828, for Norfolk Island and Tasmania 1802-1811, and many immigrant and convict records from 1829-1837 along with full text short biographies of 11,000+ residents of most colonies/states published 1881-1907. The database is a work in progress and will be regularly updated with new datasets, expanding towards the present to include all Australian states.